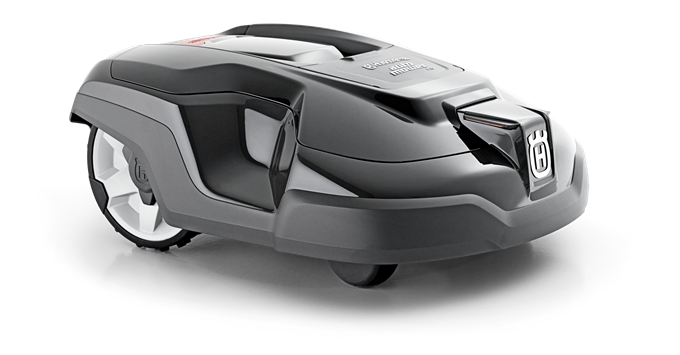 Husqvarna Automower cordless lawn mowers are the latest in grass cutting technology. 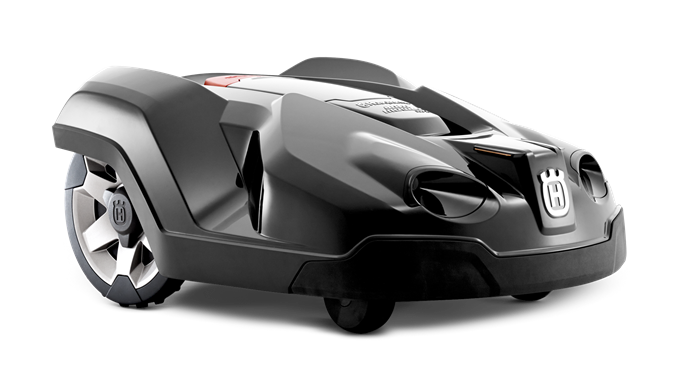 Husqvarna Automower cordless lawn mowers are smart enough to negotiate the challenges of large and complex lawns. Keeping your lawn healthy can be a lot of hard work. The Husqvarna Automower isn't just a lawn mower. It's a robotic concept that does the work for you without your supervision, around the clock. Getting your lawn to look perfect is simple. 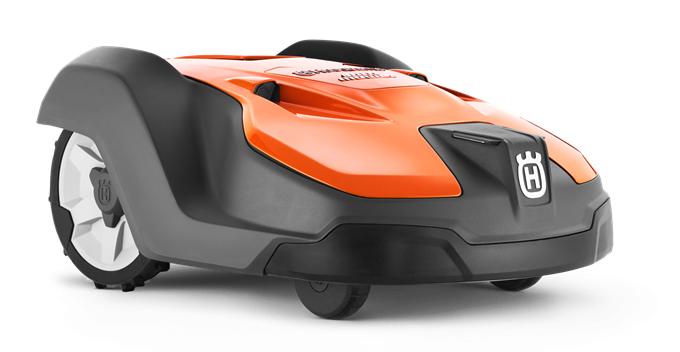 The working area is deﬁned by boundary wires and several navigation tools to ensure the Husqvarna Automower covers your entire lawn, even working in the most complex of environments. 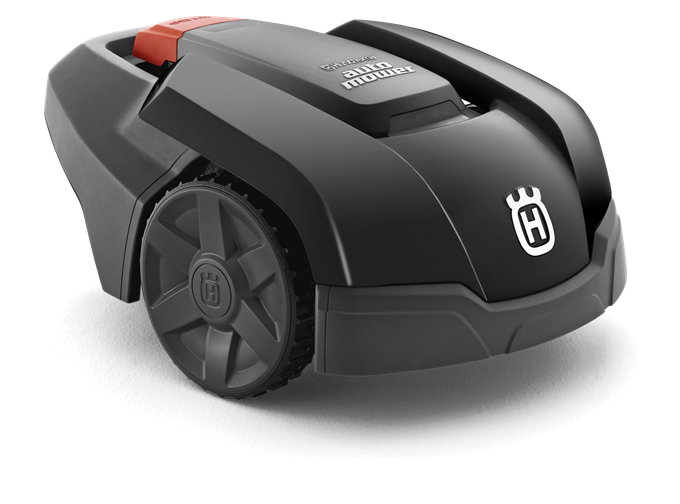 The robotic mower can sense narrow passages within the garden and easily ﬁnds its way through the narrowest of gaps. 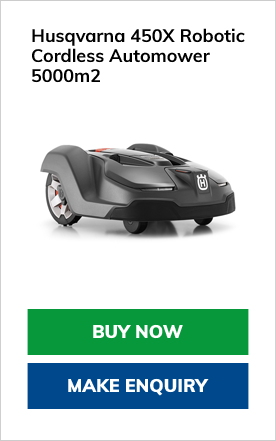 The Husqvarna Automower uses razor-sharp blades which cuts every blade of grass, resulting in a stunning looking, lush, green lawn that conventional lawn mowers cannot achieve. 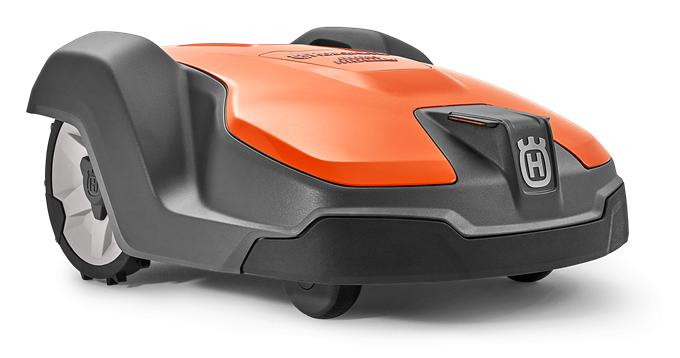 The robotic mower can cope with slopes up to 45% (24°). There is also an optional terrain wheel kit which we can supply to improve performance on slopes. The built-in slope compensation feature ensures a perfectly cut lawn, whatever the challenge. The Husqvarna Automower gives you great cutting results in all weather conditions come rain or shine. Its operating parts are safely protected from water, dust and grass clippings. 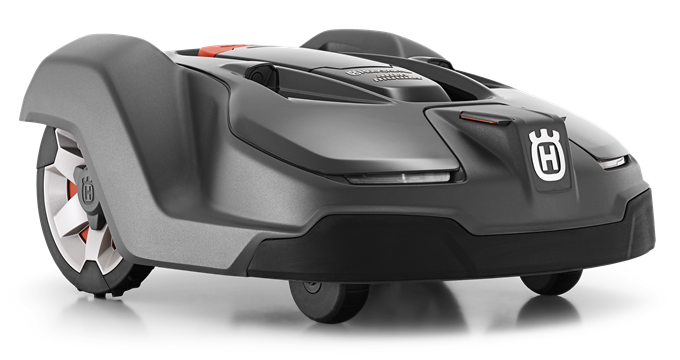 Even on wet grass, the Husqvarna Automower knows how to vary the route back to the charger to avoid unsightly grass track marks. 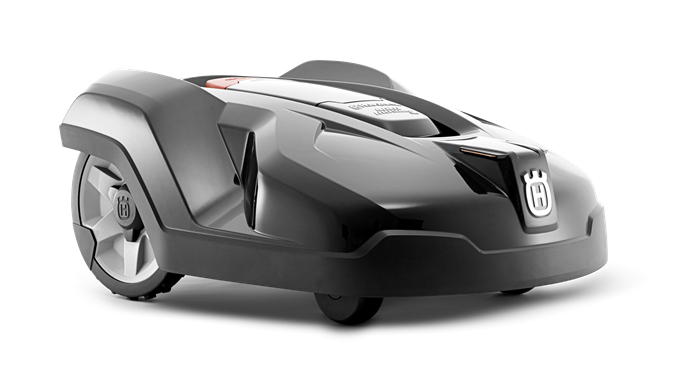 The Husqvarna Automower mows in a seemingly random pattern which is the secret to a lush carpet-like lawn. You’ll hardly notice your Automower as it operates around your garden doing its job quietly and efficiently with no noise & no disturbance to your neighbours with its quiet operating system. 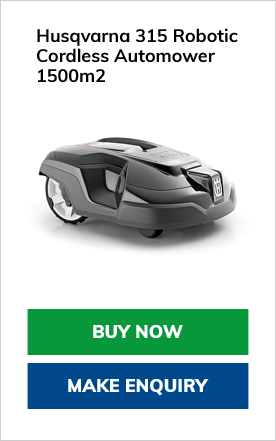 The Automower Connect app is the latest technology and gives you full control of your mower directly from your smartphone wherever you are in the world. You can set start, stop and park commands, check and adjust settings, receive alarms and even track your mower’s position. On selected models only. 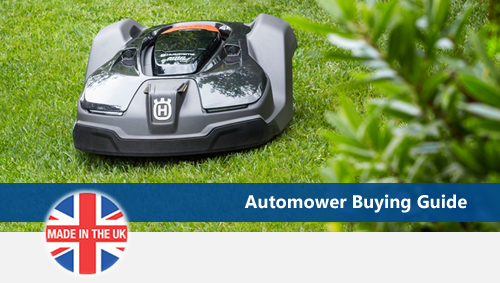 There is a Husqvarna Automower model for every type of garden & grassed area whether it be a park, football pitch or golf course. From the smallest, straightforward of areas to really complex ones with slopes and narrow corridors. When looking for the correct mower you should pick one that can handle the terrain and size of your lawn. Remember that the cutting capability is generally based on a flat and open garden, so if your lawn is undulating or there are bushes and flower beds it’s better to choose a mower with a greater capacity and higher specification. This is also important if you don’t want it to cut during the night. Does your garden have steep banks? If you have a garden with steep banks and slopes you should pick a mower fit for the job, with power and good traction to cope with its challenges. Robotic mowers work even when its raining, so pick one with wheels that have a high grip rate. 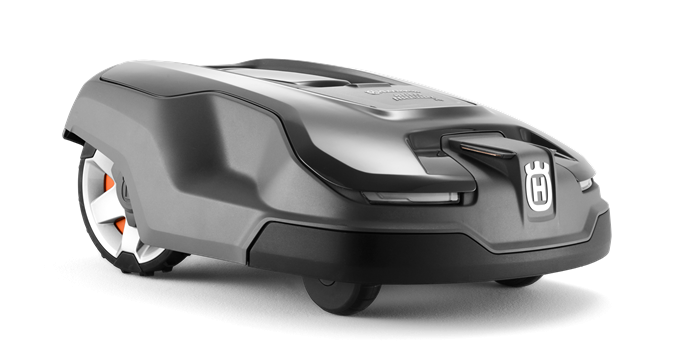 Our most powerful version is the Automower 450X, which handles slopes with up to 45% inclination. If your garden has different sections, intricate passages and corridors you have to ensure that your mower is capable of handling a complex garden. A tip is to use guide wires which easily move the mower through the narrowest of passages. Make sure that your robotic mower is set-up with a pin code lock to ensure unauthorised use. The alarm and GPS-tracker is an extra security feature on certain models. If your machine is ever stolen report it to a Husqvarna dealer and they should blacklist your mower, making future servicing impossible. Most people don’t think about it when selecting a robotic mower, but it’s a good idea to check how the system actually works. Ask about the features and operation of the machines and have a look at the display if possible to see if it is clear, intuitive and easy to navigate for yourself. Remember that even if most settings are done when installing your mower, timer settings and cutting length often change over a season. Children and pets should never be allowed to be in the same area as the mower, but of course this can sometimes happen. Automowers have a cutting disc with pivoting blades. Since the mower cuts each day it only cuts a little bit and if a paw or foot gets under the mower, it will not result in a serious injury. Begin by taking a look at your lawn and to reduce the risk of having your machine getting stuck or damaged, the grass must to be cleared of all rocks, twigs, tools, toys and similar obstacles. 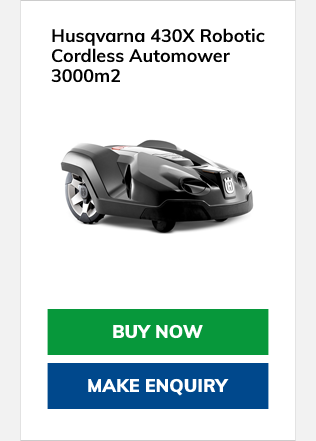 Also, if the grass is longer than ten centimetres you are recommended to cut it with a regular lawn mower one last time before installing your Automower. Place the charging station on flat ground in the middle of the cutting area with free space around it. Make sure the station is free from sunlight, out of reach of taps and water sprinklers and close to an electric power socket. Once the charging station is in place and connected to a power supply, it’s time to charge your robotic mower and let the fun begin!. Put the robotic mower in the charging station and move on to the next step. Charging an empty battery takes 80-100 minutes. The boundary wires are put along the edges of the lawn to define the cutting areas. 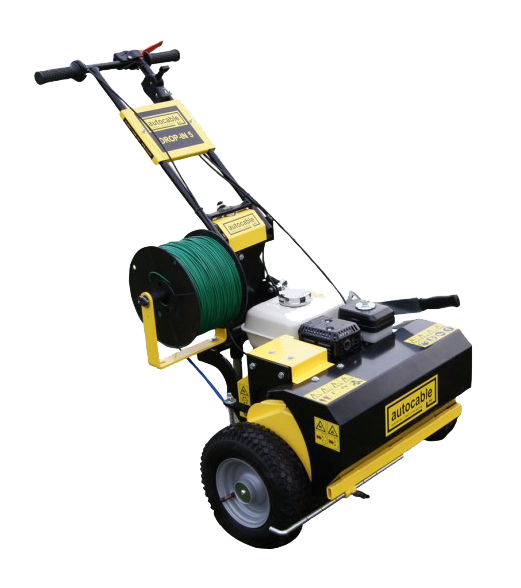 Simply attach it to the ground with the special pegs enclosed within the installation kit and the robotic mower will know exactly where to turn. Put “islands” of wire around flowerbeds, tree stumps and bushes to keep the mower from bumping into them. Turn on your Husqvarna Automower, select your four-digit security pin code for extra security, adjust the cutting height and set the working hours. And that’s it! The robotic mower will charge until ready before it heads out – at which point you have officially mowed the lawn for the last time. Your Automower is now in charge of looking after your garden. We understand that purchasing an Automower is a financial commitment, so it is essential to get the installation correct first time. All Automowers work within an area of your garden marked out by a guide wire running around the perimeter of your lawn. We offer a complete installation & set-up service using the Autocable Drop-In 6 professional cable-laying machine. Once fully tested, we will run through all the features & benefits of your new Automower answering any questions you may have. All you need to then do is sit back & enjoy your new lush lawn. 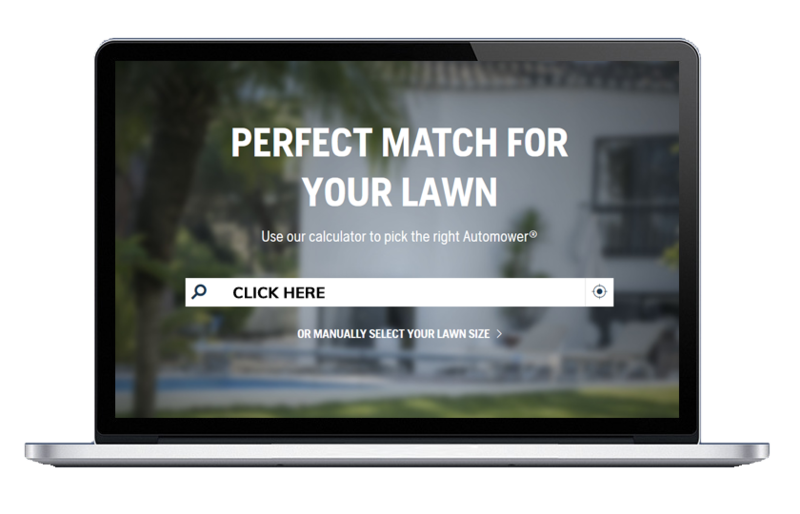 Find the perfect robotic lawn mower match for your lawn by using our lawn calculator. Simply add your postcode and draw a border around your lawn. Based on your lawn size, slopes and the complexity of your lawn, we will suggest the most suitable Automower for your lawn. The lawn calculator tool best works & is optimised for PC desktop use. Husqvarna Fleet Services is a unique cloud based system that enables safer and more productive landscaping operators, compatible with commercial 520 & 550 models & a selection of other gardening tools. Husqvarna Fleet Services shows you how your machines are being used; guiding you to make the right decisions to create the conditions for a high utilisation rate. The interactive system alerts you and your service dealer 25 hours before a service appointment. This allows you to be strategic about maintenance, thus maximising your uptime. The vibration reports and active coaching on improved working techniques allows you to be proactive and improve the health of your staff as well as the efficiency of their work. Make decisions based on facts – not estimates. What if you could have the status of your machines at the touch of your fingertips? What if you could always be proactive, always a step ahead of competition? Husqvarna’s Fleet Services does just that. It gives you the insights you need to make the best and most profitable choices for your business. 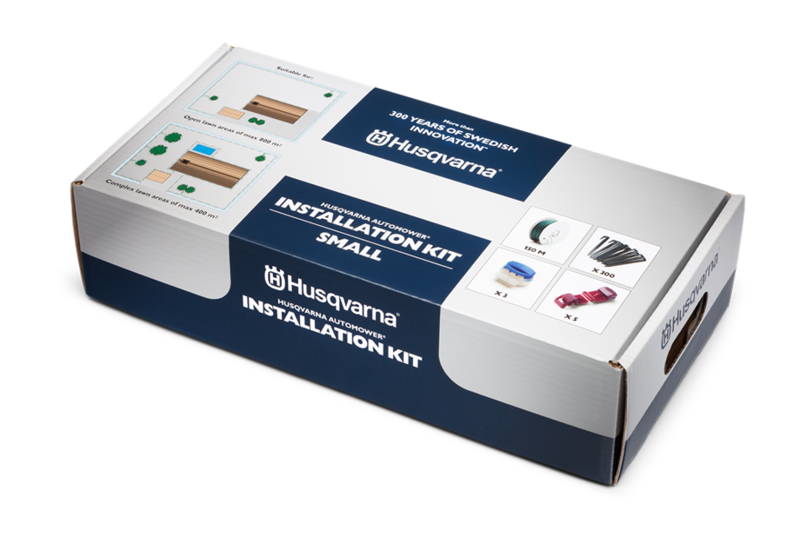 It’s easy to get started with Husqvarna Fleet Services. The dealer equips your machines with sensors, which records the machines’ usage parameters. You also have an option to purchase so-called operator electronic id cards, which automatically and wirelessly will be paired with the machine sensors. The dealer registers your machines to your management website and provides you with a login. You connect the supplied base station to the Internet. When within a range of 20 – 30 metres from the base station, the sensors upload the usage data wirelessly via the base station to your pages, where it’s transformed into easily accessible information that tells you the exact uptime and productivity for your machines. Your start page on Husqvarna Fleet Services is like a dashboard of your business. It gives you an overview in an instant of what is working well and what isn’t. You clearly see what to do in order to maximise uptime and profitability. But that’s far from everything you’ll find online. Husqvarna Fleet Services is available by subscription. When you equip a machine with a sensor, you’ll get a digital service book. You can then subscribe to Machine Workday Log and Machine Statistics. If you equip your operators with ID cards, you’re able to subscribe to Operator Workday Log, Operator Statistics and Vibration Reports. You can add or remove services at any time via your Husqvarna dealer. First decide whether you want to monitor your machines only or if you’d also like to equip the operators of your staff with ID cards. The latter will allow you to get a view of their working conditions and their productivity and it will provide you with tools to help them in their profession. When the decision’s been made, your dealer can help you get started with the right gear. The machine sensor is a small battery powered sensor, retro fitted on the machines. The machine sensor detects engine-on time, engine revolutions (rpm), Operator tags, temperatures, etc. The data is stored on a memory and automatically uploaded to the cloud via the Base station when within range of the Base station radio. The machine data is further analyzed in the cloud providing notification, tips, conclusions etc which operators, technicians & managers can analyse & act upon. Each installation requires a base station, which is typically mounted where machines are stored. One base station can serve many machine sensors. The base station functions as a server that gathers information from the machine sensors. The Operator Tag has the size of a thicker credit card and it 'connects' the operator the machine being used. The Operator Tag continuously transmits its ID number which the machine sensor detects. The ID of the machine and the Operator is then merged in the cloud which enables the system to keep track of who is running the machine. This enable the system to provide specific run-time feedback to each machine operator regarding workday log, machine handling, vibration doses etc. Husqvarna Fleet Services is available by a flexible subscription model that let you choose which parts of the service you’d like to take part of. You can add and remove services at any time via your Husqvarna dealer. Please feel free to contact us to discuss your requirements or if you have any questions regarding our Husqvarna Automower range. **To maintain the 3 year warranty, the machine must be serviced annually in accordance with the operators manual by an Authorised Husqvarna Dealer. Husqvarna provide a one year manufacturer’s warranty on all machines. With this purchase you are eligible to an extended two years when your machine is registered by an Authorised Husqvarna Dealer.